The “Butterfly Garden” was a project by several artists who created butterfly stepping stones and planted flowering shrubs, wildflowers and herbs that would attract butterflies and other pollinators. It is now used as a place to learn about gardening, the environment and additional art activities. 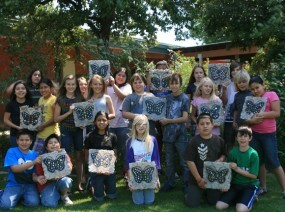 Students with new butterfly stepping stones they created for the Butterfly Garden. The middle school at Big Park is engaged with re-vitalizing a neglected garden and have started to use the garden as part of their study of biology and science. This entry was posted on Thursday, August 28th, 2014 at 6:45 am. 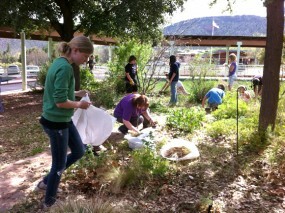 It is filed under Big Park Community School, SCHOOL GARDENS PROGRAM. You can follow any responses to this entry through the RSS 2.0 feed.